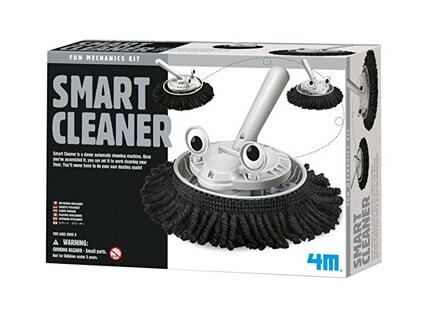 With 4M’s Smart Cleaner, you can construct a smart sweeping cleaner by applying mechanical engineering concepts in a fun and recreational way. The Smart Cleaner is a clever automatic cleaning machine. Once you’ve assembled it, you can set it to work cleaning your floor. You’ll never have to do your own dusting again. The Smart Cleaner Kit from Toy smith requires two AA batteries and a Phillips head screwdriver (not included.) This item is recommended for ages eight years and up.